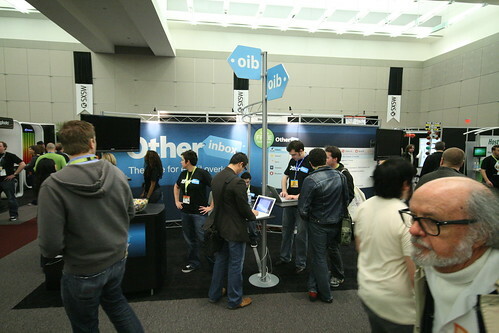 Stop losing traffic at your exhibit with the usual trade show display. Join the media revolution with eye-catching monitor mounts and interactive tablet stands! One of the best ways to attract visitors to your trade show display is to incorporate modern technology like flat screen monitors and touch-screen tablets. The moving displays are eye catching while the tablet kiosks attract many who are interested in playing with interactive technology. CNN reported in 2011 that the number of wireless devices in the U.S. already outnumbers the entire county’s population. To address the growing need for advanced tech products in trade show exhibits, APG Exhibits introduced an entire line of Multimedia Displays to fit a wide variety of devices. We can create a stand-up informational kiosk, a trade show display with interactive motion sensitive fabric, or a display counter with an iPad. Adding these mutlimedia displays to your trade show exhibit will attract additional attention and traffic to your trade show display. The Tablet Stand series of Formulate Displays is a new addition to our multimedia trade show displays, showcasing bold, modern designs that incorporate the modern conveniences and professional look of touch screen tablet devices. Another hardware addition to the Formulate family is the monitor mount with shelf. This addition can only any monitor up to 50 lbs and includes a shelf for additional display room. The hardware and graphic additions for the Formulate Tension Fabric Trade Show Display turn the Formulate series into a do-it-all modular system. These additions work with all 10′ and 20′ Formulate backwall trade show displays, allowing you to add a wide variety of graphic accents and functionality to create a display perfectly suited for your trade show booth space.